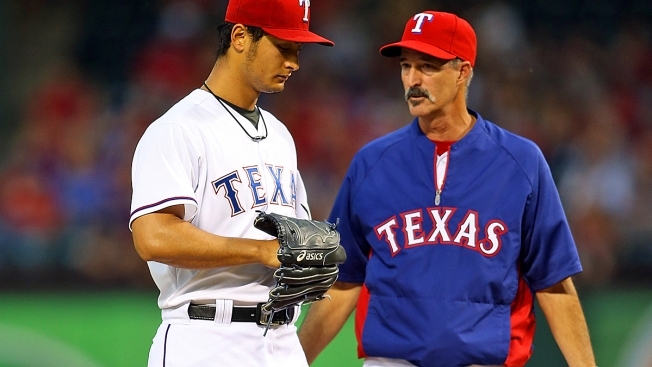 ARLINGTON, TX - APRIL 28: Yu Darvish #11 of the Texas Rangers talks with pitching coach Mike Maddux #31during the third inning against the Oakland Athletics at Globe Life Park in Arlington on April 28, 2014 in Arlington, Texas. By all accounts, we've heard that Mike Maddux wants to stay on board for the Texas Rangers as their pitching coach for the 2015 season under new manager Jeff Banister. In fact, he's been in Arizona pretty much since the Rangers' season ended to work with the team's young pitchers. That's encouraging. Also, from all we've heard, the reports are good on the meetings that have taken place between Banister, who's still in the process of compiling his staff, and Maddux, who has established himself as one of the game's best pitching coaches. Yet, nothing has been officially announced yet regarding Maddux's immediate future with the Rangers, who also employ his brother/Hall of Fame pitcher Greg Maddux as a special assistant to general manager Jon Daniels. That has to be a good sign. The longer Maddux hangs around in Arizona working with Rangers pitchers, and the longer Banister goes without tabbing someone to be his pitching coach that isn't named Mike Maddux, the better chances, it seems, that he will return. Keep your ears open, but it seems the Rangers will still be the employer of one of the best pitching coaches in the game.